Available in matte black or white, the Playbase isn’t going to wow existing or prospective customers, but it is a very logical move for the wireless hi-fi company. 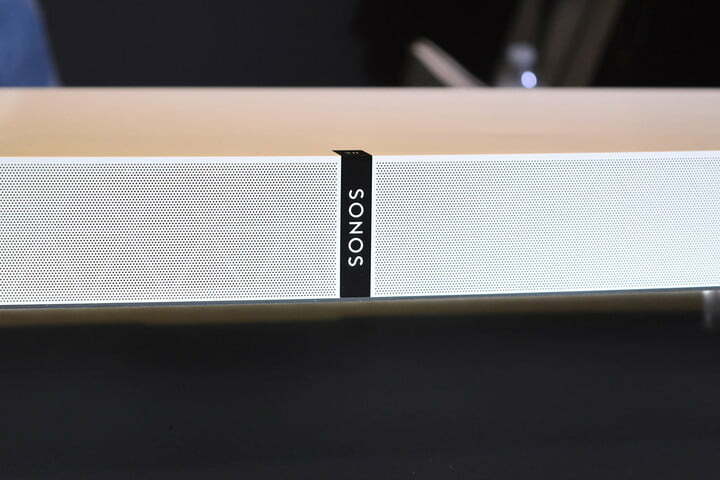 While Sonos’ soundbar — the Playbar — has been popular, the company says a lot of customers have struggled with placement. After all, unless you mount your HDTV to a wall (something Sonos claims only 30 percent of us do), you need enough vertical lift for the TV that the Playbar isn’t obscuring the bottom of the screen. 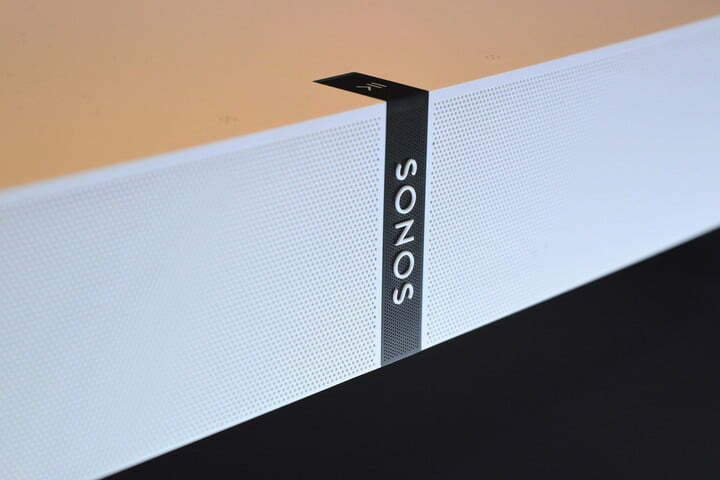 According to the Consumer Technology Association, “soundbars surpassed the $1 billion mark in 2016 for the first time and outperformed all other home audio components in unit sales and revenues last year.” So by this logic, being able to tap into the 70 percent of folks who find soundbars awkward, could be a huge windfall for Sonos. Putting the system under the TV solves the placement puzzle but raises a new challenge: How do you get really good sound (especially really good bass) out of a speaker enclosure that’s less than three inches tall? To show off how it tackled that challenge, Sonos took the unusual step of inviting journalists to its Boston headquarters to get a glimpse behind the scenes. We were not only shown some of the prototypes Sonos created during the Playbase’s 4-year development period, but we were also shown two fully disassembled Playbases, their hundreds of parts laid out on a table like an IKEA assembly diagram. Creating an enclosure that would support the weight of a 55-inch TV, keep away Wi-Fi interference, and allow all of the sound frequencies to emerge unfettered and pointed in the right directions presented some monumental design challenges for the team. Of course, the Playbase also had to match the minimalist design aesthetic that characterizes the rest of the Sonos lineup. After much experimentation, the team finally landed on a design that called for the drilling of 43,000 individual holes in the fascia. Because there are five different sizes of holes — which start small near the middle of the cabinet and gradually increase toward the sides — they had to be drilled rather than molded. 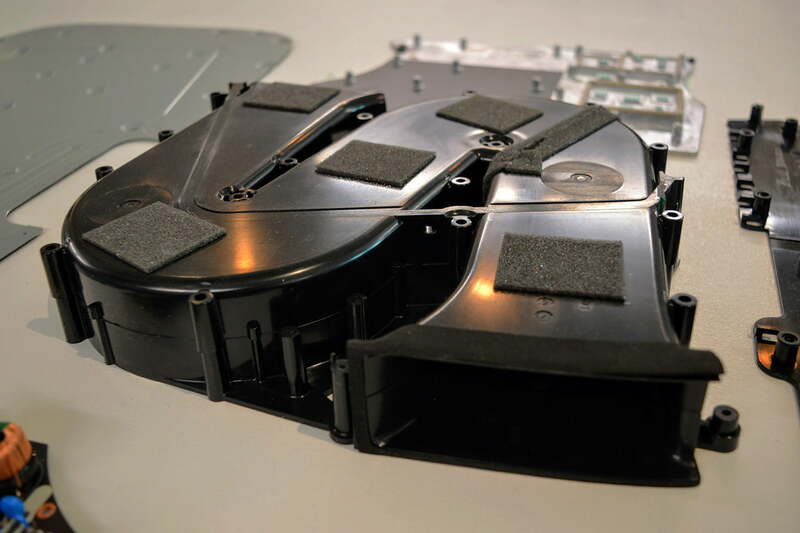 In order for the bass to escape, the holes near the reflex port needed to have a larger diameter than the ones covering the midrange drivers and tweeters, but if this diameter had been used for all of the holes, it would have compromised the look of the speaker. To support the considerable weight of a TV, the enclosure has its own integrated plastic skeleton, which is still partially visible through the thousands of holes. Its diagonal beams criss-cross the internal wall, adding much-needed structure to an otherwise incredibly thin layer of material. The top of the cabinet, which is permanently and seamlessly bonded to the sides, gets help from a series of custom metal posts scattered throughout the Playbase’s body. Sonos’ design team insisted that the Playbase stand no taller than 2.28 inches, which it says is the maximum height that you can elevate a TV before it starts to make people feel like their screens are perched awkwardly. But what the Playbase lacks in height, it makes up for in width and depth. At 28.35 inches wide and 14.17 inches deep, it can handily accommodate even the largest mid-mounted TV stand, while remaining narrow enough to sit between the edge-mounted legs of some newer TV models. The design leaves enough room for 10 Class D digital amplifiers within, alongside a custom-designed subwoofer. Exceptionally thin, though still able to move a significant amount of air, the sub’s vibrations are channeled through a large, S-shaped port before emerging through some of the specially sized holes in the Playbase’s side. 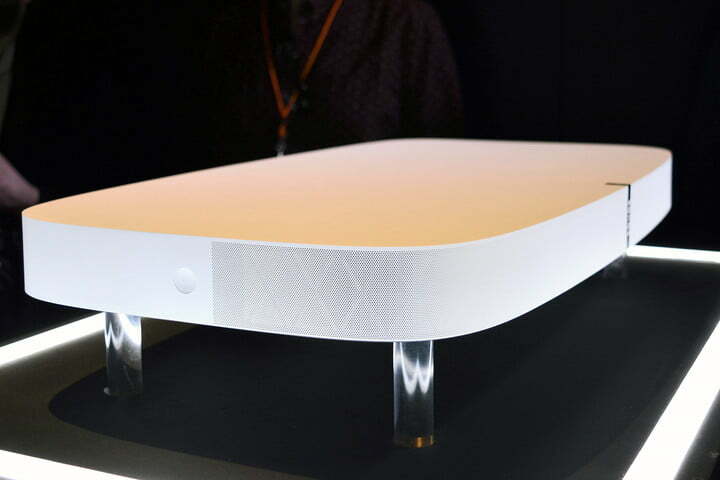 Like most surround soundbars, the Playbase achieves its surround effects by projecting sound against walls, causing it to bounce back to the listeners’ ears from the sides. But Sonos has always claimed that its software is the key to its sound quality. Using the company’s Trueplay feature — which uses the mic on your phone or tablet to measure sound — the Playbase can auto-tune itself to your room’s specific acoustics. The Playbase keeps the dialog enhancement and night mode settings from the Playbar and can reproduce 5.1 surround sound when paired with a set of Sonos speakers in the rear of the room — and of course the company’s Play:SUB subwoofer, though that setup is a costly proposition of almost $2,000. Unfortunately for many home theater aficionados, the Playbase shares another feature with the Playbar: It has only a single input, and it’s not HDMI. The lone optical port takes an output feed from your TV, which means that if your TV can’t pass 5.1 surround, Dolby DTS, or other multi-channel formats (which many models can’t do) you’ll be forced to either live with down-converted sound or seek out third-party gear that can output these formats, like Roku’s line of set-top boxes. During the launch event, Sonos gave reporters the chance to audition the Playbase in a number of environments. There were listening rooms at the company’s headquarters, but Sonos had also rented out a small multi-level house in downtown Boston to let us hear what the speaker sounded like in a more typical home environment. 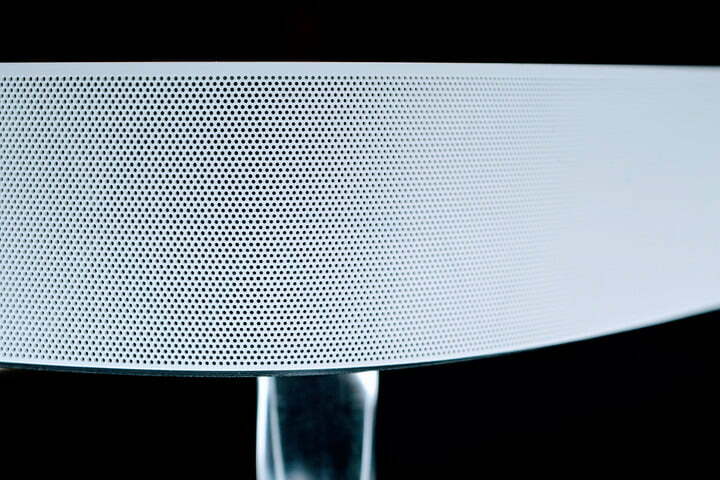 Much like Sonos’ other speakers, the Playbase produces sound that by all rights should not be able to come from a speaker with its dimensions. While this effect isn’t as pronounced with the Playbase as it is on the diminutive Play:1 speakers, it’s still impressive. The Playbase can easily push out room-filling sound, and does an especially good job with both the bass and treble registers. If the Playbase was meant to be just a music product, this balance would be a bit unwelcome, but given its primary mission as an upgrade experience for your flat-screen’s pathetic built-in speakers, it’s a good thing. Sonos’ work on designing a custom subwoofer for the Playbase has paid off: Though obviously not as deep and chest-rattling as a system with a dedicated sub, the Playbase manages to produce enough low-end that apartment dwellers might just have to keep the volume in check to avoid upsetting the neighbors. If you want genuinely skull-shaking bass, you’ll still need to pair the Playbase with a Play:SUB, but if your intent is to buy just one component to improve the quality of your TV and movie experience, the Playbase should fit the bill nicely. Speaking of fitting, we can’t say enough about the Playbase’s elegant design, especially when compared to every other sound base on the market. Sonos claims the Playbase “appears as though it was cut from stone,” and that’s not far from the truth. Even upon very close inspection, finding seams on any of the visible surfaces is impossible. Both the white and black versions possess the peculiar quality of being plastic, yet not looking or feeling like plastic — at least not the kind of plastic you typically find on consumer electronics. But it’s the Playbase’s amazingly short height that sets it apart. It’s got the lowest profile of any soundbase we’ve encountered, and the combination of its size and minimalist design lets the speaker all but disappear. In its black color, with a 50-inch TV sitting on top, the Playbase simply looks like part of the furniture. We do worry about the Playbase’s price, however. At $699 USD, it’s in a category by itself. The Yamaha SRT-1500 soundbase has a much lower MSRP, and along with Yamaha’s Musiccast Wi-Fi system, the system packs a lot of features you won’t find in the Playbase, like Dolby and DTS decoding and Bluetooth. We won’t render judgement on whether or not the Playbase’s audio performance justifies its premium price until we get a chance to do a full review, but in a competitive field, it’s got its work cut out. The Sonos Playbase is available for pre-order today at Sonos.com if you’re an existing customer. On April 4, it will be available globally.